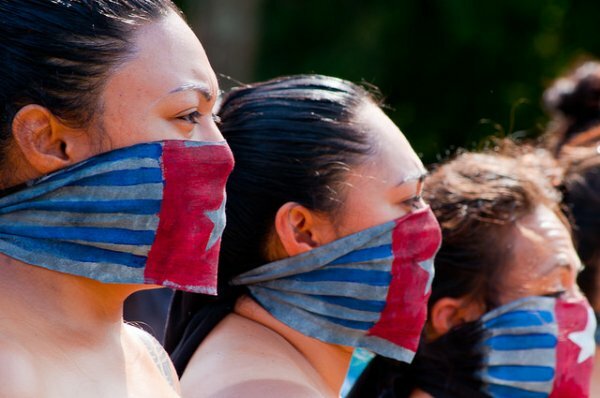 Indonesia has been restricting media access in its Papua and West Papua provinces for over 50 years. Consequently, coverage of the ongoing armed conflict is very limited, as foreign journalists rarely get access to the region. Allegedly, a foreign journalist has to follow an authorization process in which 18 different institutions are involved. Despite the great expectations that he had raised during his campaign, President Joko Widodo has until now failed to change the human rights situation in West Papua. Most of the human rights violations in the region remain unpunished and, too often, unreported. With more than 50 years of restricted media access, one of the least covered armed conflicts in the world is the long-simmering struggle between Indonesia's military and the secessionist Free Papua Movement. Under Indonesia's seven successive post-independence governments--the early ones led by autocratic strongmen, the recent ones more or less democratically elected--the world has been deprived of details of the persistent low-intensity battle for autonomy playing out in the Papuan provinces. Without open media access in the Papua and West Papua provinces, alleged abuses by security forces operating without media scrutiny will hound any bid by President Joko Widodo to bring peace and prosperity to the resource-rich region: a promise he made on assuming office in October. Given Indonesia's experience in East Timor, it is no wonder successive Indonesian governments have restricted media access to its Papua and West Papua provinces. Unable to completely stifle media coverage of East Timor during a bloody 27-year war for independence that ended in 2002, Indonesia's leaders appear determined not to lose another part of its far-flung archipelago by having troublesome reporters, international or Indonesian, expose what is happening in Papua. And there are discomfiting economic and social angles too: Restricted press coverage has meant little media scrutiny of Freeport-McMoRan Incorporated's Indonesian copper mine at Grasberg, the world's largest gold and second largest copper mine in the world. The American-owned company has long been Indonesia's top tax payer, and its remote operations in Papua have been targeted by insurgents and environmental groups. Journalists--including a BBC team who wanted to visit the mine in 2011 when reporting on strikes--often find access is denied. Despite the wealth of its natural resources, Papua has historically fallen far behind in development compared to Indonesia's other regions, analysts say. The region's literacy rate is around 74 percent, Indonesia's lowest, and Papuans find themselves under increasing demographic pressure, too. Indonesia's in-country migration is coming close to making Papuans a minority in their traditional homeland. About 50 percent of the population in Papua and West Papua are from other parts of Indonesia, and the in-flow seems most likely to continue, analysts say. Many things seem deeply amiss in Papua, and they are going unreported. Because of the media restrictions, it is largely foreign journalists who get the international attention that comes with being detained and eventually shipped back home. An Australian academic, Ross Tapsell, in his book By-Lines, Balibo, Bali Bombings: Australian Journalists in Indonesia, published in January, has a large section on restrictions in Papua dating back to the 1960s. Indonesia continues to require international correspondents to secure special visas before entering the country, a practice CPJ has repeatedly (see here, here, and here for examples) urged the government to abandon after it was used to blacklist reporters under earlier, more authoritarian regimes. The government seldom, if ever, issues permission to investigative journalists. "Eighteen ministries and related institution are involved in the process to issue a permit," according to the Foreign Ministry's director of information and media, Siti Sofia Sudarma. She was testifying at the October 2014 trial of the French documentary filmmakers Thomas Dandois and Valentine Bourrat, who were convicted of breaking immigration laws by trying to film in Papua. The pair had been detained for almost three months before being expelled from the country after their conviction. Their trial coincided with President Widodo's election campaign, in which he promised to address Papua's problems. Siti said that, according to the ministry's data, 28 international journalists had submitted permit requests to cover news in Papua and West Papua in 2013. She said 21 had been allowed to enter the two provinces. But Andreas Harsono, a Jakarta-based researcher for Human Rights Watch, told CPJ by email that those getting the permits are tourism writers or Japanese journalists covering the search for remains of soldiers killed during World War II. And such restrictions beg the question of what is so special about Papua and why journalists are allowed to cover other areas of Indonesia with little government interference. The restrictions go against Indonesia's 1999 Press Law, which says there should be no restrictions on journalists in Indonesia. It is not just outsiders who have complaints about access to Papua. As we have reported over the years, Indonesian journalists are prey to a host of malevolent actors--from politicians and the military to religious hardliners and business owners. And unless they are native Papuans, Indonesia's journalists have an almost impossible time getting in to cover the story. As far back as 1999, CPJ noted that ethnic and communal violence in many parts of the country made local reporters' jobs increasingly dangerous. More recent assessments by groups including Human Rights Watch show the situation has deteriorated further despite pledges from successive governments to address the political confrontation. There was a sense of optimism following Widodo's election. We called it a Window of opportunity to advance press freedom in Indonesia following a mission there in late 2014. But we noted steady pressure on media across the country. The 2008 Electronic Information and Transactions Law targets Web commentators with up to six years in prison, and up to IDR 1 billion ($80,800) in fines. Criminal defamation cases carry a nine-month jail term. And a worrisome state secrets bill, viewed by critics as a threat to freedom of information, remains under discussion. Nor has there has been movement to address impunity in the cases of 10 journalists confirmed to have been killed for their work since 1992. Eight of them appear to have been murdered, according to CPJ data. In such a context, it is realistic to view the president's pledge to allow international journalists and organizations access to Papua and West Papua with a high degree of skepticism until those restrictions are lifted, a promise that can be quickly and easily fulfilled.